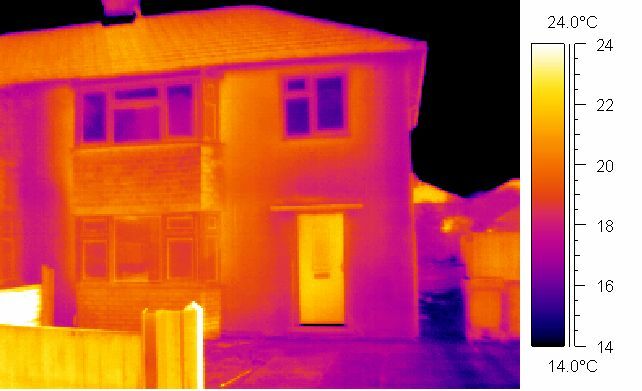 Today we received the thermal imaging photos that were taken of the houses before we started the retrofit work. Thermal images are photos taken with a heat sensitive camera that shows the temperature of the subject. Photos were taken of the houses before we commenced the retrofit work to illustrate the areas of heat loss from the building. Similar photos will be taken after we have completed the retrofit work, and will hopefully tell a very different story. The photo below illustrates the high level of heat loss from the bay of number 28 – the lighter the colour, the higher the temperature, and hence level of heat loss from that part of the building. If you are surprised by the level of heat loss from the bay, the video below will show you the reason why. Don’t be misled by the light colour of the roof; the loft space was quite well insulated, and we believe this high temperature was caused by direct sunlight falling on the roof. Additionally of course, it could have been caused by heat escaping up from the bay, as we saw in the video above. The bays are being removed as a part of the retrofit, so will no longer be an area for concern. In the video below, project manager Nick Martin talks us through the main fabric improvements that are going to be made to the properties. Our aim is to incorporate HHP design principles in a retrofit, i.e. combining high thermal mass, passive solar gains and high levels of insulation to remove the need for a space heating system, and therefore significantly reduce running costs and emissions from the homes. We will post further videos over the coming weeks looking at various aspects in more detail as we progress the retrofit work. We hope you enjoy this summary, and please let us know what you think. Both houses are now empty and we’ve commenced on the preliminary internal works, which is basically stripping out fixtures and fittings, internal ground floor walls, and existing loft insulation (which has been set aside to be re-used).